Please contact boat owner Craig at 559-217-3408. 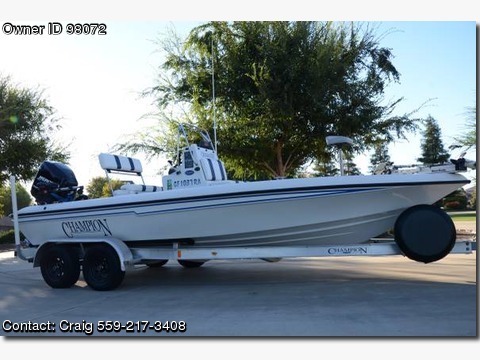 Champion 21 Foot Bay Champ No disappointment&#39;s, This is a very clean center console boat ready for fun or to start your guide service. Power is a 2003 200XL Opti Max Salt, Approximately 150 Low Hours, seen salt twice while I&#39;ve owned it. 5 Blade SS prop. Mostly lake fishing. 82lb Motor Guide driven by dual batteries. Lowrance LMS 520C with GPS up top, Eagle fish finder up front. Two live wells, Scotty Electric down riggers, wash down, new ice chest. Trailer has been rebuilt with new breaks, leafs, spindles, electrical, including trailer emergency breaking system. Boat has been serviced and detailed every year.